Romhacking.net - Review - Gotta go fasterfasterfasterfaster! Indeed they don’t. 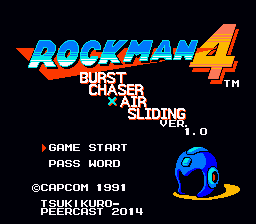 Burst Chaser X Air Sliding, as the title suggests, combines gameplay elements from two hacks: Tsukikuro’s own Rockman 3 Burst Chaser, and Yuki Miyuki’s Rockman 5 Air-Sliding. So basically, you move really fast, and can slide in mid-air now. 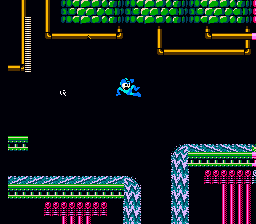 The hack also changes the level design, the boss A.I, the weapons, the colors, and the music. The level design is very well done and polished, providing lots of fun and replay value. 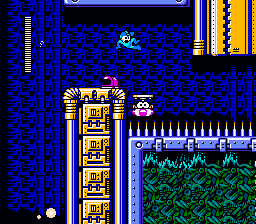 Unlike the original Air-Sliding, which was more oriented on puzzles, BCXAS is more focused one bare-bones platforming, which I don’t find to be an issue. The boss A.I, while difficult at times, is still very nice. 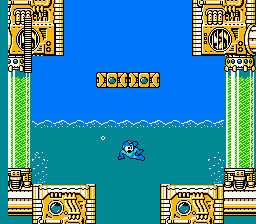 Each boss is given lots of new personality, especially given that the boss fights in the original weren’t that difficult, and had lots of room for improvement. BCXAS definitely changes that, which I greatly appreciate. I don’t have much to say about the weapons, seeing as they aren’t really that different. Dive Missile is faster, Skull Barrier can be thrown, Ring Boomerang goes farther, Dust Crusher flies at an ark, and the rest have very small changes that aren’t really worth mentioning. While not very different, the weapons are still fun to use, so I’ll let it pass. The new music is great! Lots of awesome tracks. While I didn’t know what games most of them were from, I still enjoyed them nonetheless. 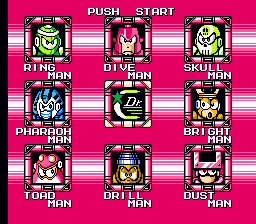 The only tracks I recognized were the title screen music, which was from Shadow of the Ninja(NES), and some of the Wily Castle themes, which were from other Mega Man games.